My kids like to cook from time to time. Reid seems to like to cook the most, and frequently asks to help make dinner, or to make brownies (his specialty). Several times, we have made recipes from children's books. I have even blogged a few before, but it has been a while. I picked this book up at a thrift store. 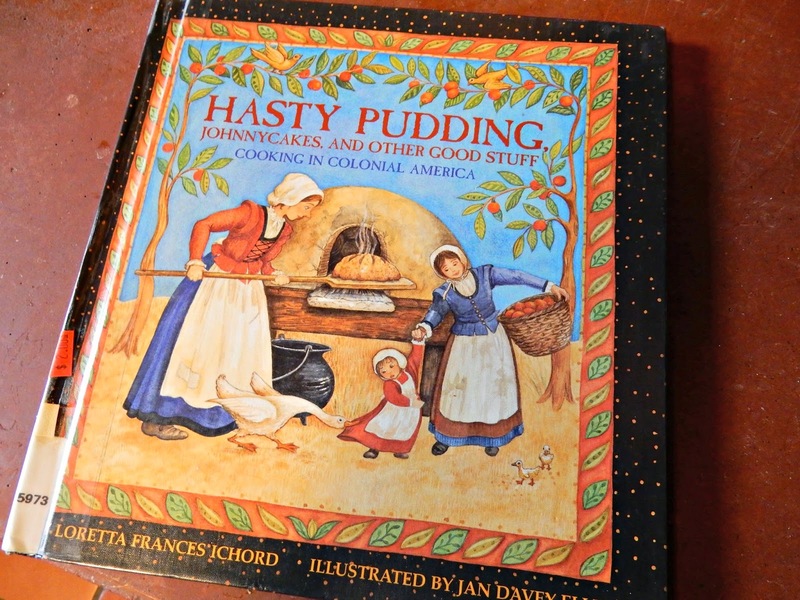 It's pretty interesting, and contains a number of recipes from Colonial times. Reid decided he wanted to make a recipe from it. He chose peanut soup. This is a Virginia delicacy of sorts, although it has never been my favorite. We learned from the book how it would have been made years ago - the peanuts smashed with mortar and pestle instead of blender, and roasted over a fire. Everybody tried the peanut soup. Reid was proud for making it. Some of us liked it better than others. Regardless, it was fun to try something new. Maybe we'll make another recipe from the book soon! I have had a spicy version of the soup. I make a mole sauce that has peanut butter in it. I liked to introduce cooking to my kids. All are good cooks now like their dad. When I get bored in the winter I enjoy checking out a few books to try. I've never had peanut soup, so don't know if I'd like it; we are rather fond of a spicy peanut and chicken soup... a Nigerian recipe. Yum! Look at that smile on Reid's face, perhaps he'll be a chef one day! 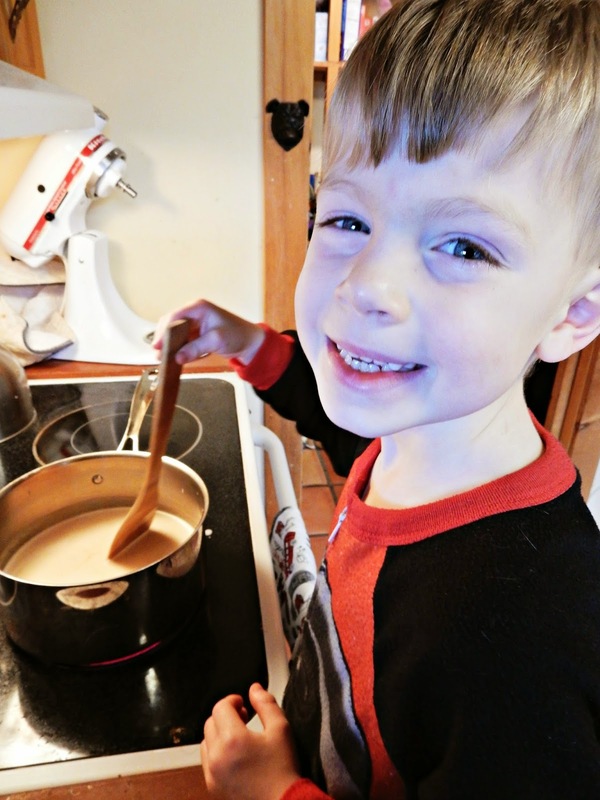 I have never tried peanut soup, but I think it is great that your boys want to cook. Their wives will be happy one of these days! Even though I'm a native Virginian, I've never had peanut soup. That is so cool that the boys are learning cooking skills. They sure do! Your happy photo shows how much fun they have too! I have never tried it, but I have heard of it. Now I want to try it. I think it is so important to teach boys to cook as well as girls. All kids should be able to take care of themselves when they move out. I've never heard of Peanut Soup! He looks so proud of his accomplishment! I love children's recipe books! So much for the kids. It's good he's interested in cooking. I have never eaten nor heard of, peanut soup! I have seen it on the menu in Williamsburg, but I haven't tried it. I haven't had any in years. It was okay, but it wasn't really exciting. My grandson really likes to cook. He even brings a dish to my house sometimes when he comes that he is made. No, never had it yet. But it does sound like it's probably very healthy! Hello. Invite you to watch my new photographs on the blog. I have a nice weekend. I made a sweet potato peanut butter soup once. I was the only one that loved it. :( I thought it was great. Everyone one else in my house was like, "It's so gross." Oh well. Maybe I'll make some for just me.